Tucked in the northwest corner of the Lower Peninsula, Michigan's longest lake is a dramatic 18-mile glacial lake that at first glance, appears to mimic the waters of the Caribbean. Its blue clay bottom and clear water are known for producing intense color variations, changing from emerald green to fiery gold to a deep turquoise. "Torch Lake is not pastoral, it is dramatic," says Lynne Delling, a long-time resident of Torch Lake and a local Realtor. "It can kick up in five minutes and have big waves, or be flat as glass." While it possesses Caribbean color, the ever-changing Torch Lake sits on the 45th Parallel and is part of a chain of 14 lakes that flow through Michigan's Antrim County. Its long summer days, intense sunsets and constant northerly breezes that blow off Lake Michigan have attracted generations of families to its shores since the 1920s. They came from Chicago, St. Louis, Detroit, and Cincinnati, fleeing the city heat for a quiet, laid-back cottage life on the lake. Several villages -- Bellaire, Eastport, Alden, Clam River, and Torch Lake -- surround the two-mile-wide lake, offering a sleepy town lifestyle peppered with restaurants, shops, and recreational outfitters. Locals and visitors alike gather at Moka for coffee and pastries, head to Shorts Pub to savor seasonal ales, and dine at casual foodie establishments like LuLu's. Also within reach are the vineyards of up-and-coming wineries near Traverse City such as Brys Estate. Torch Lake is famous for its two-mile-long sandbar, a gathering place where boaters line up to swim and socialize, and a prime spot to watch fireworks on the Fourth of July. Those who prefer sailing, head to the Torch Lake Yacht and Country Club. Established in 1928, the family-oriented club offers sailing lessons and an active racing schedule for its members. Those without a boat can rent everything from pontoon boats to ski boats to jet skis from local purveyors. Also popular are non-motorized sports such as canoeing, windsurfing, and kayaking. Swimming in the spring-fed water, which warms up to 80 degrees during the summer months, is also a favorite past time. 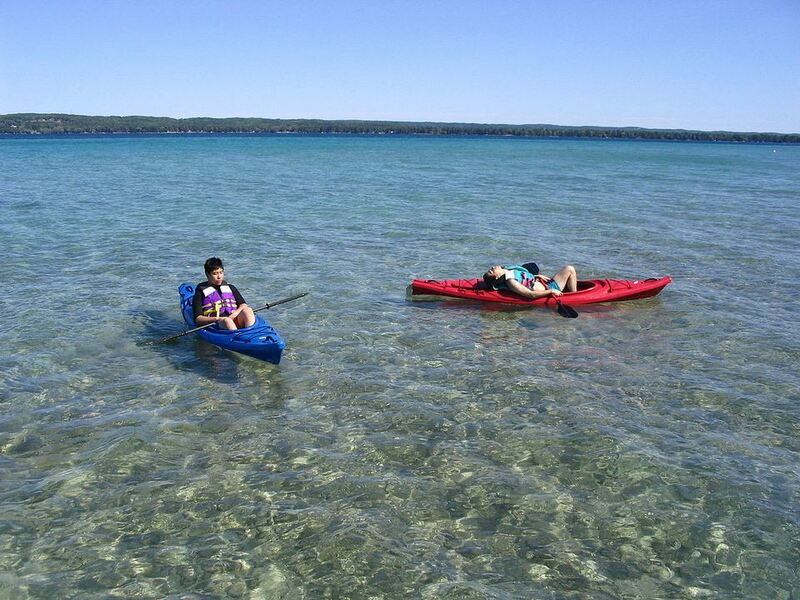 With depths of up to 340 feet, Torch Lake is Michigan's deepest inland lake. Ideal for fishing, anglers will find a variety of fish--wide mouth bass, trout, pike, and whitefish. In 2009, one angler caught a 50-pound, 8-ounce Great Lakes Muskie, setting a new Michigan state record for this species of fish. Off the lake, golfers have 26 courses nearby, including the Arnold Palmer-designed Legend course and three others at Shanty Creek. Hikers can access a variety of trails at the Grass River Natural Area and Coy Mountain. The end of summer is marked by Bellaire's Rubber Ducky Festival, a celebration the includes food, arts, crafts, a parade, and a Rubber-Ducky race. In September when the hardwood trees begin to show their color, the town host a Harvest Festival and Scarecrow Extravaganza. During the quiet days of winter, residents take to the trails for cross-country skiing and celebrate the holidays with a Gift Fair and a Lights of the Holidays celebration. Be sure to do these things, too: Take sailing lessons, go on a hike, tour the vineyards, rent a pontoon boat, and hit the links. History and the sun divide Torch Lake's real estate scene. Back in the 1920s, families came from surrounding cities and built rambling cottages on large plots of land on the east side of the lake. Torch Lakes modern manses were built during the 1990s when development grew rapidly on the west side of the lake. "The cottages are on the east side are generational properties," says Delling, who began vacationing with her family on Torch Lake in 1947. "These residents moved here with their families for the summer and then passed their homes on to other family members." Living on the east side comes with perks, most notably the prevailing winds from Lake Michigan, which help keep the mosquitoes at bay. "People prefer the east side for its colorful sunsets," says Delling. The west side of Torch Lake caters to early risers with pink sunrises. The west side also features calmer water and beaches with fewer rocks. No matter which side you choose, both offer a variety of vacation home opportunities. On the east shore, you can purchase a furnished custom Maple Island log home with 168 feet of waterfront for $1.2 million or settle for a gated community with golf course views for $229,000. On the west side of the lake, a modern home built in 1998, set on 12 acres with 929 feet of lakefront costs $1.9 million while a cozy ranch style cottage set on the lake can be found for $525,000. What is Jobbie Nooner? When is Jobbie Nooner? What Is Fontanel Mansion in Tennessee? Exploring the Tidal Basin in Washington, D.C.